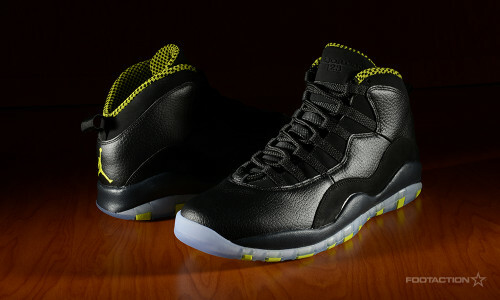 The Air Jordan 10 Retro “Venom Green” is one of those cases where the newly-introduced accent color defines the pair. This particular pair, is a dominantly black base mix of tumbled leather and nubuck accented only by a translucent outsole and hints of the nickname. Only a few months into 2014, this is already the fourth general color way of the Air Jordan 10. Maximizing the essence of the Jordan 10, this option does so with restraint to create an identity of its own. Print article This entry was posted by hhcblog on March 20, 2014 at 12:45 am, and is filed under Footwear. Follow any responses to this post through RSS 2.0. You can leave a response or trackback from your own site.